Less is more, and that couldn’t be more truthful when using digital plug ins. Today’s plug in repertoire is practically endless, with several options to choose from in EQ, dynamics, effects, emulation and so on. Despite having limitless options to choose from, the reality is that a warm mix comes from using the least amount of digital processing possible – and correctly. More often than not, excess plug in use takes away the integrity of the audio within a mix. I refer to this common mistake as over-processing. Again, less is more. Certainly, the most important part of avoiding over-processing is attaining a proper recording at the source. All processes occurring before a signal enters the DAW are crucial, so experimenting with microphones and their position toward the source, preamps, cables, proper gain, and room acoustics cannot be overlooked. Furthermore, if the talent’s performance can be improved, record until an exceptional take is attained. Ultimately, even the best plug ins cannot make up for errors in this part of the recording process. Additionally, when recording, ensure your DAW’s session is operating at a sample rate of 44.1 kHz in 24 Bit. For music and audio, these are the best settings for attaining a recording with integrity, I assure you. 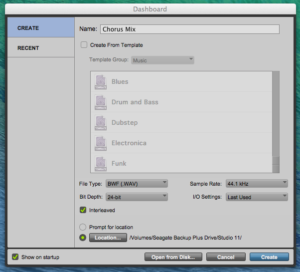 In ProTools, these parameters are set in the first window when starting a new session. When a project is finally finished, export in 44.1kHz and 16 Bit, today’s standard CD playback format. Every so often I will receive files from a client to mix at a higher sample rate or bit depth than 44.1k/ 24 bit. A myth floating around is that recording at a higher sample rate is better since more information will be sampled. While this is true, the audio will actually lose integrity mathematically converting back down to 44.1/ 16 Bit. As I will cover in plug in usage, every digital procedure in recording, mixing and mastering cannot improve resolution of the source. Everything in the computer operates in binary code. Essentially, what is recorded literally becomes converted into numbers within the DAW. These numbers are fed into any given plug in, and the different numbers come out. A good engineer must always consider the delicacy of a digital signal, in that, the integrity of digital audio can be lost in translation from plugin to plugin. A rule of thumb is to make the computer crunch as little numbers as possible. Assuming I am approaching a mix with correctly recorded audio on each channel, I first ensure all audio is properly gained. Overall, the whole mix should have decent headroom. Remember, in a ProTools session, the gain of the clips in the edit window is applied before passing through the channel. Clip gain is significant since most digital plugins work optimally when the input signal has healthy gain. 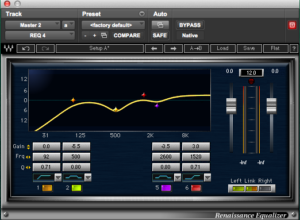 For example, an industry staple I use is the Renaissance Compressor from Waves, a solid dynamic tool. However, the algorithm does not function as well at a low threshold setting. With respect to the Renaissance Compressor, adjusting clip gain will work better than having to duck the threshold. Importantly, like analog gear, digital plug ins also have sweet spots in terms of gain staging. Plug ins and vocals can be tricky – and very susceptible to becoming over-processed. Not only are vocals very dynamic and wide in frequency range, they can also contain offensive resonations due to the microphone or acoustic space used in the recording process. When dealing with vocals in the DAW, critical thinking and listening always must be practiced. Similar to “painting oneself into a corner,” the same goes for mixing vocals. This occurs from not being attentive toward what a vocal needs in a mix, and what each plug in facilitates. Vocal plug ins must be implemented with a plan to avoid over-processing. Moreover, sometimes plugins help one need of the vocal, but undermine other elements as we pay attention to one specific improvement. Particularly, compression or reverb can re introduce mid range frequencies previously scooped out. Overall, applying plugins on vocals can take one step forward and two steps back when a single plugin function distracts us from the sound as a whole. Most of my ProTools sessions contain vocal channels with reductive EQ, compression, and a de esser as my first plugins, respectively. I consistently try to use them as efficiently as possible, often in corrective methods to fix unwanted sonic characteristics. One thing I’ve learned is if any surgical approach on vocals is executed without utmost accuracy, especially in the initial plugins, over-processing is bound to occur. With each plugin you apply, you really have to nail it on the head. Inaccurate surgical EQ is never beneficial. With respect to a reductive EQ, which is often my first plug in on a vocal, I usually am notching out a specific, offensive frequency in the upper mids (between 2100Hz and 5000 Hz). I would go as far to claim whistle tones in this range of vocal frequencies are the most detrimental factors responsible for harsh, cold-sounding music in today’s industry. These resonations can be found plaguing Kelly Clarkson to Drake, and in many cases are the reason music becomes uncomfortable to listen to – after enough time at a live venue, or wearing headphones. Please, do not confuse musical brightness or crispiness with vocals that are, in fact, strident and piercing! As a result, if I hear an offensive whistle tone resonation that consistently pokes through a vocal recording, I prefer to surgically cut it out, or notch the frequency first. Remember, notching can hurt the integrity of a vocal recording if not executed accurately, creating a “phasey sound.” In fact, for avoiding over-processing later in the signal flow, there is no margin for error in initial EQ notches – doing it wrong will come back to bite you later in the mix. Positively, the target frequency must be crystal clear and gone after reducing the surgical EQ’s gain. Importantly, when notching, experiment with the narrowness (and wideness) of the EQ band. Again, the subtracted frequency must be nailed to a T – an offensive resonation may seem properly removed at 4000 Hz, but even more effectively taken care of upon setting the EQ to 4100 Hz – a very slight, but imperative adjustment. Use your ears here! Ultimately, a proper surgical EQ cut will remove an unwanted frequency for good, and not uncover additional, offensive frequencies into the signal. Excess surgical EQ is practically synonymous with over-processing; surgical notches, if needed, usually should not occur more than three to four instances in a mix. Remember, a key pillar to avoid over-processing is organizing plugins so the computer does not have to work as hard. A helpful strategy to limit number crunching is to send all vocal channels to a single bus for further EQ, compression, de essing, or effects processing. Often when mixing choruses containing stacked vocal recordings, I will send all channels to one stereo bus, where I tend to cut any mid range build up, as well as boost musical frequencies of the vocal. Applying these additional boosts and cuts to each individual channel would simply require too much Digital Signal Processing. The bus is a great tool for keeping processing efficient and CPU lightweight. Particularly, EQ(s) on my aux busses for vocals often apply a high pass filter, one or two scoops to address offensive mid range build up (usually between 200 and 550 Hz), as well as a high shelf for presence. Before scooping out any mid range, simply reducing the bus volume is worth testing! Applying a high shelf on the bus also must be done carefully, as to avoid boosting harsh frequencies in the upper mids where the ugly whistle tones thrive. Furthermore, I am careful to not set the shelf gain too high. I also include an additional scoop in the upper mids around 2600 Hz, if necessary, to reduce harshness in the vocal. In conclusion, less is more, still, and always. I encourage using any surgical EQ on individual channels when mixing vocals. Vocals then may be sent to a bussed EQ to ease the number crunching on your machine. All in all, do not approach EQ nonchalantly or inattentively. Make sure the EQs are neat and orderly. 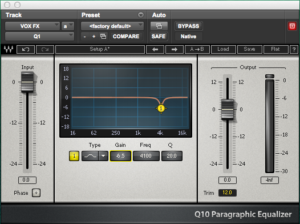 Confirm your EQ(s) and all plug ins are improving the vocal signal without taking one step forward and two back. Using digital tools efficiently is key for a warm mix in the box. If you find yourself applying excess EQ and plug ins, on the verge of over-processing, start over. There likely is a better way. When it comes to mixing, every little detail matters. A de-esser provides an easy way to ensure that sibilance doesn’t throw off the entire mix.